Well, Apple would be much less than it is today. Much less. The more than 300 retail stores allow Apple to take risks that other tech companies can't, and lets new customers -- the majority Windows PC users -- take chances on Macs and iOS products, too. The stores also nurture a vibrant ecosystem of software and peripherals that might not be there without the stores. Related, Apple learns lessons from the retail shops it extends to its virtual iTunes and Mac OS applications stores. Apple Store may be the smartest thing ever done by the company. The retail stores enable Apple to build better products. Ten years and one week ago today, Apple CEO Steve Jobs introduced journalists to the company's first retail shop, at Tysons Corner Center in McLean, Va. Four days later -- May 19, 2001 -- that store, and another in Glendale, Calif., opened for business. At the time, analysts were skeptical about Apple's retail experiment, given the recession and Gateway's exit from retail -- closure of 40 stores, later shuttering them all. Apple Store was from the start all about risk and the company's willingness to take a big one by going into retail at the seemingly worst time. After all, it wasn't just the recession: Apple had reported several consecutive quarterly losses before May 19, 2001. But the grand retail experiment also allowed Apple to take risks that competitors couldn't or wouldn't. Apple Store started with risk, and the company continues that tradition to to this day. Betanews founder Nate Mook and I IMed about this topic on Friday night. "Nothing can touch the iPhone's battery life," he asserts. "It's about 50 percent better than the Nexus S, I'd say." In December, we both switched from iPhone 4 to the Samsung manufactured, Google-branded smartphone. Now we've both abandoned Nexus S for iPhone 4. "Nothing can touch the MacBook Air's battery life, or even the MacBook," he observes. "But it would be easy for manufacturers to copy -- get rid of the replaceable battery -- and redesign the battery cell like Apple." But what competitor takes the risk -- to develop innovative, non-replaceable batteries? None, really. Now why is that? Apple Store is major reason. If the iPhone battery dies or the handset has any other problems, buyers can feel confident to pop over to an Apple Store and get it replaced. Apple feels confident to risk such a design because it has the stores. What would that same customer do if his or her Samsung phone with fixed battery had problems? Mail it to Korea? Samsung doesn't have the same retail infrastructure, so it can't take the same kind of product risks that Apple does. I use Samsung as example because the company otherwise has huge manufacturing and distribution infrastructure. What it lacks at the point of sale is crucial, and it's what hugely differentiates Apple from all competitors. So Apple can take a lot more risks than other manufacturers. Again, think about the non-replaceable battery for iPhone and Mac laptops. Without retails stores, Apple really couldn't have risked such development. It's easy enough to ship out a replaceable battery, if the customer has problems. Non-replaceable means shipping smartphones or laptops out for repair, or to be taken to a local Best Buy or other retailer. The manufacturer has no control over the latter option, nor be assured the customer will be satisfied with the result. If an iPhone or MacBook Pro customer has a problem, an Apple Genius will fix it, locally. For free, if under Apple Care. Or replace it. In March, Apple replaced my 11.6-inch MacBook Air, at the Genius Bar, after it developed problems. I was so thrilled, that I stood in line the next afternoon for iPad 2's launch. My daughter and I both have iPad 2s now. Apple has complete control over the customer experience and has rightly chosen to make customer satisfaction a top priority at its retail shops. That's not just about problems but the consulting work to get customers up and running, which includes the ever-increasing training services. Remember, before Apple opened its first store, the majority of businesses or consumers used Windows PCs -- and they still do today. So these Windows users can feel more comfortable taking the risk to buy Macs, or other Apple products. Not only does Apple offer them a safe place to take their products, it offers them a better place. What? You want to take your Windows laptop to Best Buy's Geek Squad for repair -- and pay -- when an Apple Genius might fix your MacBook Pro for free? Risk, it turns out, is a two-way street. Would There be iPhone, if No Apple Store? Apple can take more risks because of the retail shops. What would iPhone be if not for Apple Store? 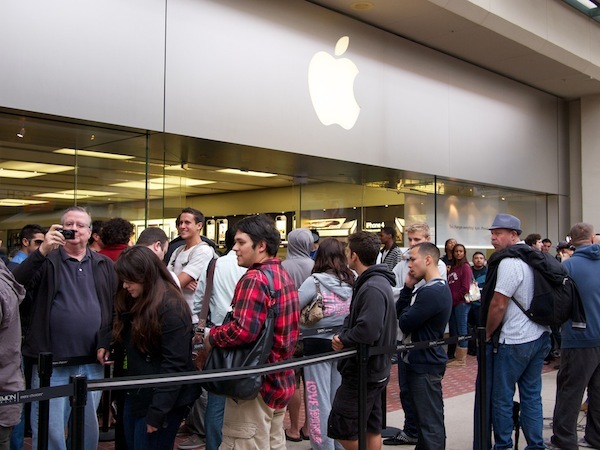 Could Apple realistically have jumped into the cell phone market without its retail shops? I don't think so. The stores allowed iPhone's June 2007 launch to be an event, with long lines. Outside Apple Store Montgomery Mall on June 29, 2007, iPhone shopper Steve told me: "I think this is a day that you're going to see a change in how computers, how handheld computers are done. It's a little marketing history. I'm seeing it that way...I think we'll look back in 10 or 15 years, and like on that day the gadget came out, same thing with iPod, it changed the game." That prediction proved to be right but in shorter time horizon. But Apple needed its retail shops to take the risk -- to be able to get the original iPhone from manufacturing to distribution. From where did Apple sell most of the first iPhones? Not from AT&T stores but its own retail shops. By every measure, iPhone was a huge risk for a company with no experience manufacturing such device. What about the smartphones that followed? Where would be the original iPhone's successors, if not for Apple Store? Where would the throngs gather, if any? Those lines of people helped create even more interest in Apple products, generating buzz among bloggers and journalists and on Wall Street. Apple Store has injected the company's brand into the public consciousness. Remember, the first stores opened before Apple sold a single iPod but later were the all-important points of sale for the music player -- and of course Macs and the iOS devices that followed. The aforementioned long lines for iPhone, and more recently iPad, are part of that consumer lexicon. Apple Store also feeds and supports the third-party ecosystem of products. The first Apple Stores had an area called "Software Alley," which at the time was hugely important, particularly during the transition to Mac OS X. All along, Apple Store has carried peripherals, cases and other products supporting its products. If not for Apple Store where would these be? Judging from the retail experience and supporting ecosystem before Apple Store, not much of anywhere. Perhaps unnoticed is what the Genius Bar means for Apple product development. As aforementioned, Apple Geniuses make people feel safer to buy Apple products. But they also collect loads of data that Apple feeds back into product development. Every Genius Bar visit reveals something about customers' satisfaction with this or that feature and helps Apple identify problems it can remedy in future product designs -- or ways to make them better. Surely, customers reported battery life as being one of the most important features in mobile products, which Apple turned into those non-replaceable batteries. None of this would be possible without Apple Store.